SD-WAN is now approaching mainstream adoption, allowing for the collection of enough data to better understand the development of its commercial case. With numerous SD-WAN implementations and projects under their collective belts, Coevolve and VeloCloud, now part of VMware, will share examples of the common elements and best practices that lead to a successful SD-WAN case. To keep pace, networks are undergoing a massive overhaul, a lot of the momentum spurred by trends like IoT and enabling technologies like SD-WAN. Included in the overhaul is rethinking branch routers by separating routing capabilities from the physical box. In this webinar, Zeus Kerravala of ZK Research takes a deep dive into how SD-WAN is ushering in an era of a routerless branch office. Healthcare is strictly regulated and fraught with laws that seek to protect the patient as well as the healthcare provider. In today's modern world, technology plays a huge part in the ability to serve patients but must be able to consistently adhere to current industry regulations and flexible enough to accommodate its evolution. The retail experience has become much more than just finding the product you're looking for in a store. Today, customers require much more: POS systems must always be online so credit cards can be scanned; Wi-Fi for internet browsing; in-store kiosks connected to online stores; and secured data for all. All this is dependent on a fast, secure, and dependable network with enough bandwidth to support all communications methods. In this webinar, we'll discuss how SD-WAN optimizes the overall retail experience, how segmentation ensures that traffic is prioritized and treated appropriately, and the entire process is secure at all times. Legacy network procedures and processes are traditionally focused on the individual steps required to implement change and initiate actions. Even with the automation of various steps within the process, there remains much investment of time and human resources to manually configure every activity. But as networks increase in complexity, especially with the transition to cloud-based applications and services, throwing manpower at the problem is not scalable. Instead, organizations are adopting Cloud-DelIviered SD-WAN and as an extension, outcome-driven networking. With outcome-driven networking, organizations determine the outcome they need to deliver and allow the network intelligence and automation SD-WAN provides to revolutionize their IT teams and their businesses. Coevolve and VeloCloud had a great response to our Webinar: “Building an SD-WAN Business Case – Part 1”. Now it is time to expand on that information about building a compelling business case to adopt SD-WAN and share a next level of experience. - What commercial due diligence is required and how do you evaluate it? - What are the most persuasive operational benefits of SD-WAN? - What TCO and rate of return metrics typically achieved by other enterprise SD-WAN achieving? Are you convinced about SD-WAN’s transformational potential and looking at building a compelling business case to adopt the technology for your enterprise? Coevolve and VeloCloud has been working with enterprises to help develop and validate a variety of SD-WAN business models, taking into consideration the transition between existing environment and the new SD-WAN environment and the entire service lifecycle. Join Tim Sullivan, CEO of Coevolve and Sasha Nunke, Director of Marketing, VeloCloud as they discuss how to build a viable SD-WAN business case for enterprise. Lin Huang, Sr. Solution Engineer, APAC at VeloCloud Networks, Inc.
Voice quality monitoring is essential for anyone, whether Service Provider or Enterprise, with voice deployed in their network. It is an indispensable capability – from either a business or operational viewpoint – in the network infrastructure, and is often costly and complex. VeloCloud VQM allows you to monitor, diagnose and proactively troubleshoot network issues before they impact business-critical voice communications. 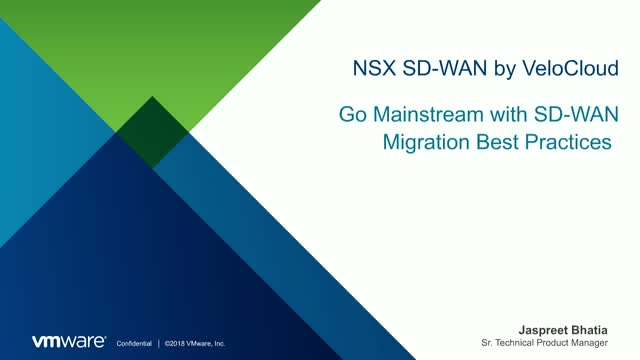 Once your enterprise makes the decision to implement SD-WAN, the question arises: how to migrate the network infrastructure with minimal disruption to business operations. Having the right feature set is important, yes, but it is just as critical to come up with the right strategy of connecting the SD-WAN to the existing network. Lin Huang, VeloCloud's Field Solutions Engineer for APAC, uses real-life customer use cases to discuss the optimal steps to a successful SD-WAN deployment in Asia Pacific.